These apple pie bites are super easy to make and packed full of delicious cinnamon flavor! Hi there! 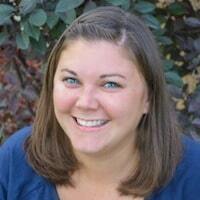 I’m Kelly from Typically Simple and I have a delicious recipe to share with you today. Since fall is just around the corner, it’s time for pumpkin flavored everything. However, I’m more of an apple-everything fan myself, especially when it comes in dessert-form like caramel apple cookies! My little guy likes to help me bake yummy treats for all seasons, so I’m always trying to think of easy recipes that we can make together. Ones that have just a few ingredients always get a thumbs up in my book because trying to work through a twenty step recipe with a four-year-old just isn’t going to end well. 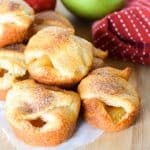 And this apple pie bites recipe is perfect for making with the kids! 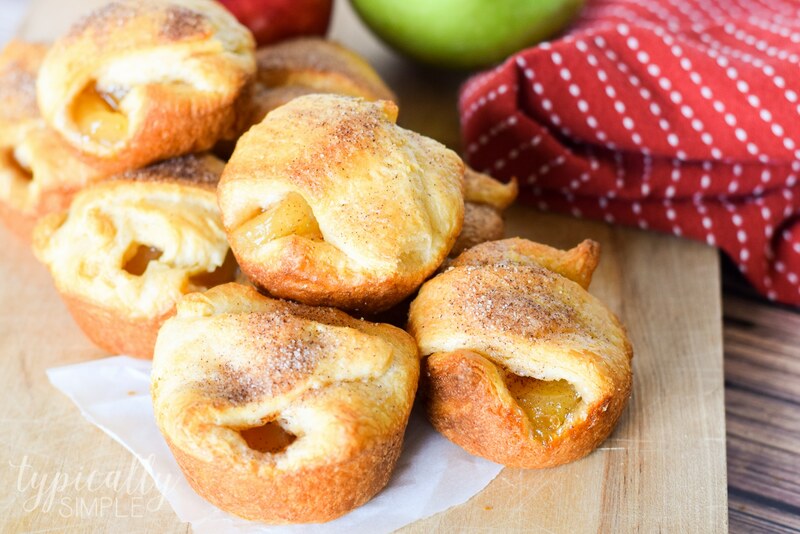 With only two main “ingredients” plus a bit of sugar & cinnamon, these little apple pie bites are a yummy fall treat! You will need two cans of crescent rolls and one can of apple pie filling for this recipe, plus a few teaspoons of sugar and cinnamon. Start by unrolling and pulling apart the crescent rolls. Coat a muffin tin with non-stick baking spray and place one crescent roll triangle in each tin. Add a heaping spoonful of apple pie filling on top of the dough. Mix together a teaspoon of cinnamon with two teaspoons of sugar. Sprinkle over the apple pie filling, then pull up the sides of the dough to cover the filling. Don’t worry if there are some holes, the dough will rise a bit while baking. Sprinkle a little more of the cinnamon sugar mix over the dough before baking in the oven at 375 for about 15 minutes. 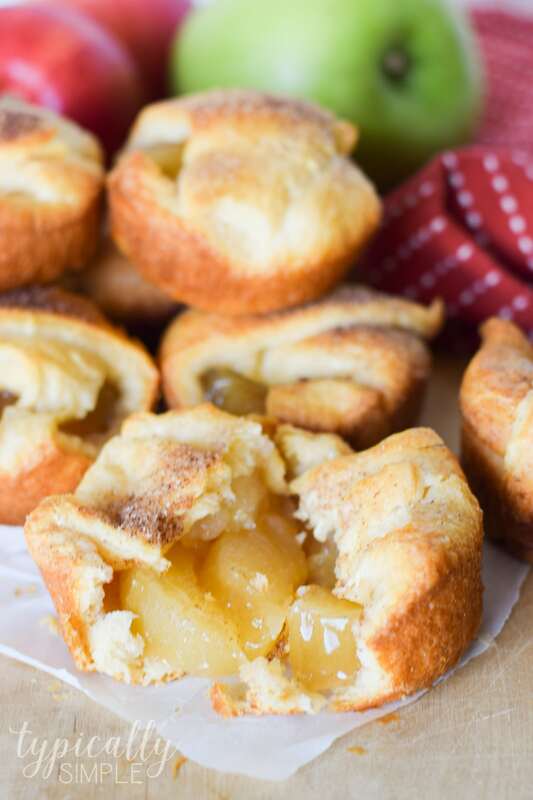 Allow the apple pie bites to cool for a few minutes before removing from the muffin tin. Serve warm and if you happen to have any leftover, store in an airtight container. They’d also be delicious to serve with a scoop of vanilla ice cream on a cool fall night! 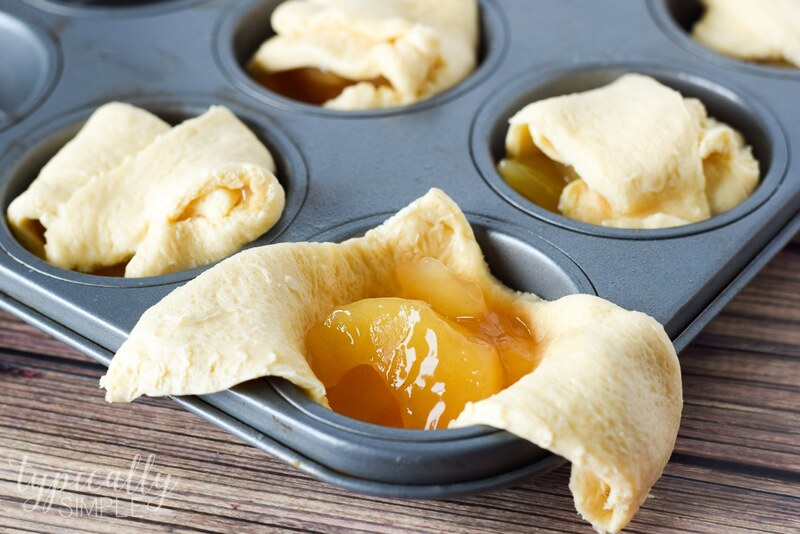 Unroll and pull apart crescent rolls, placing one triangle of dough in each muffin tin. Add one heaping spoonful of apple pie filling on top of each crescent roll. Mix together the cinnamon and sugar, sprinkle a little over the pie filling. Pull the edges of the crescent rolls up and over the pie filling. Bake for about 15 minutes, until golden brown. Allow to cool slightly and serve warm. These look delicious. I also love apple recipes so these are just perfect. I think my kids will love them too. They look fantastic. Can’t wait to make them.